datetime? Where we’re going, we don’t need datetime. This document describes Delorean v1.0.0. Delorean is the name of the car in the movie Back to the Future. The movie deals with a lot of time travel, hence the name Delorean as a module dealing with datetimes. Delorean is a library for clearing up the inconvenient truths that arise dealing with datetimes in Python. Understanding that timing is a delicate enough of a problem delorean hopes to provide a cleaner less troublesome solution to shifting, manipulating, generating datetimes . Delorean will provide natural language improvements for manipulating time, as well as datetime abstractions for ease of use. The overall goal is to improve datetime manipulations, with a little bit of software and philosophy. Pretty much make you a badass, time traveller. Delorean.epoch is a property, not a function. Delorean.midnight is a property, not a function. Delorean.naive is a property, not a function. Delorean.timezone is a property, not a function. Please make sure to update your code accordingly. Look at you looking all fly. This was just a test drive checkout out what else delorean can help with below. 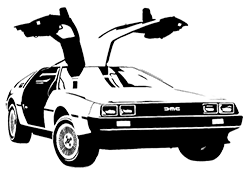 Delorean is a library that provides easy and convenient datetime conversions in Python. Dealing with generating lists of datetimes, timezone shifting, and much more. © Copyright 2013, Mahdi Yusuf.